I have posted about the Swedish news paper Metro before and I really don’t enjoy kicking someone who’s already on the ground but… So today, The 10th of June the front page breaking news of Metro is: (Roughly translated) “High amounts of pollen, Millions of Swedes suffer”. Yes people, this is the most important Metro news of the day! Anyhow… I am hyper sensitive to pollen myself and allergic to almost all variations of pollen but didn’t feel anything for many weeks now. I was like: “What? It’s mid June! There’s no pollen now? 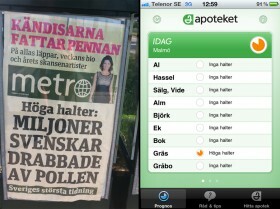 !” Since I am hyper sensitive I need to prep myself properly for each day with nasal spray and anti-histamine pills and I keep track of the pollen measurement with an iPhone app called “Pollenkollen”. So I bring out my iPhone and open up the app. Sure enough, except for some grass pollen, which more or less last all summer, there’s no measurable amounts of pollen from any of the most common kinds, just like there haven’t been for several weeks. So once again Metro, try to keep up with the news, okay guys? ← Beats Studio by Dr. Dre, as good as they say?